Binary is extremely important in the world of computers. The majority of computers today store all sorts of information in binary form. This lesson helps demonstrate how it is possible to take something from real life and translate it into a series of ons and offs. In this lesson students will learn how information is represented in a way such that a computer can interpret and store it. When learning binary, students will have the opportunity to write codes and share them with peers as secret messages. This can then be related back to how computers read a program, translate it to binary, use the information in some way, then reply back in a way humans can understand. For example, when we type a sentence into a document then press save, a computer translates the sentence into binary, stores the information, then posts a message indicating the document has been saved. Decode binary back to letters. Relate the idea of storing letters on paper to the idea of storing information in a computer. Watch the Binary Bracelets - Lesson in Action Video. Gather markers for the bracelets. Other decorations like beads and pipecleaners are optional. Print one Binary Bracelets - Worksheet per student. Print one Binary Bracelets - Assessment per student. (Optional) Write a short message on the board in binary. Prepare to show the Bits Versus Bytes - Student Video. If you've written a short message on the board in binary, call the students' attention to it and ask if anyone knows what it is or what it means. Put the message aside and move on to prepping for the activity. You can start by asking the class if they have ever seen inside a computer. 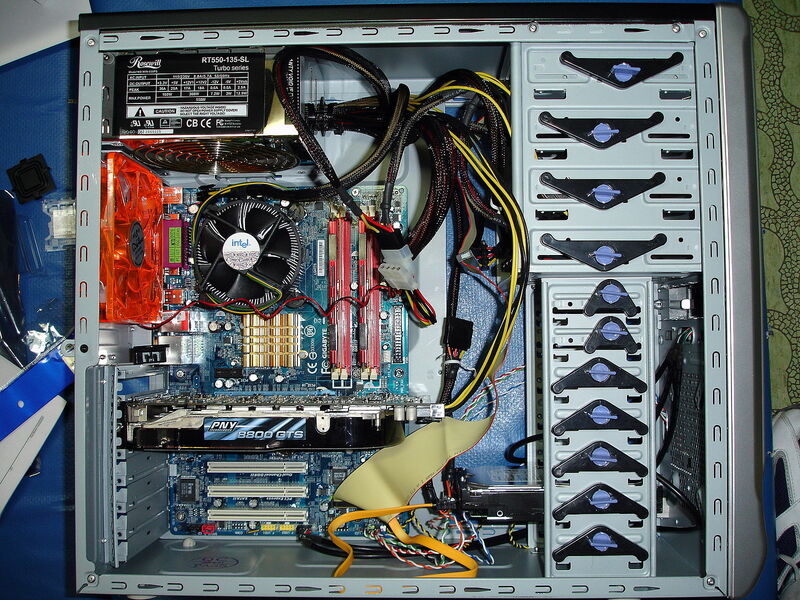 This is a good place to actually show them the inside of a computer (or pictures of the inside of a computer). The two options that a computer uses with respect to this electrical information are "off" and "on." Just like the lights in this room! When computers represent information using only two options, it's called "Binary." That theme of two options doesn't stop when the information gets to its destination. Hard Disk Drives store information using magnetic positive and magnetic negative. DVDs store information as either reflective or non-reflective. How do you suppose we can convert real-life things that we want to store in a computer into binary? Use the Binary Bracelets - Worksheet to show how a computer might represent capital letters. This is a good time to mention that each spot where you have a binary option is called a "binary digit" or "bit" for short. Fun fact: A grouping of four bits is called a nibble. Go over a few examples of converting letters into binary, then back. 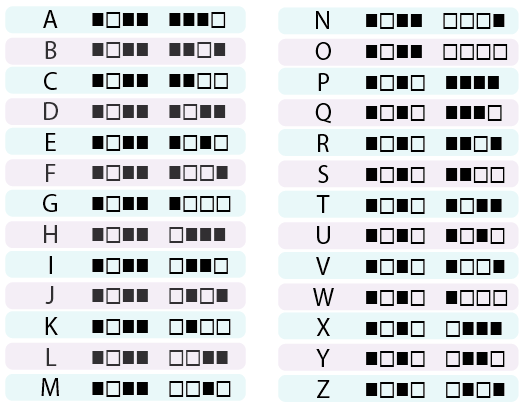 Afterward, write an encoded letter and give the class a few seconds to figure out what it is. When the class can figure out that encoded letter on their own, you can move on to the activity. You know your classroom best. As the teacher, decide if students should do this individually or if students should work in pairs or small groups. You do not need to cover the whole of binary, like counting and converting numbers back and forth from decimal. This lesson is intended to be a fun introduction to how computers store information, not a frustrating lesson in bases. Find the first letter of your first name on the activity sheet. Fill in the squares of a bracelet to match the pattern of the squares next to the letter that you selected. Tape the bracelet around your wrist to wear it! Share your bracelet with your classmates to see if they can figure out your letter. If your class has extra budget for materials, try doing this exercise using thread (or pipe cleaners) and beads to create the binary bracelets instead of pen and paper. You can provide any combination of two colors in beads to the students, but black and white tend to be easiest, given the way that the key is done. After the activity, revisit the message that was on the board and see if your class can decypher it using what they've learned. What else do you think is represented as binary inside of a computer? How else might you represent binary instead of boxes that are filled or not filled? Use the activity worksheet to write out the rest of your name or your favorite word in binary. Imagine a world where we spoke in binary, saying "on" or "off", but nothing else. Draw two characters trying to talk to each other in binary. There are several great resources on the web for taking this activity to the next level. If your students are interested in how images (or even music) can be represented as binary, you can find more details in Thinkersmith's Binary Baubles. 2.SL.2 - Recount or describe key ideas or details from a text read aloud or information presented orally or through other media.